Our 150mm (6") 45 degree flue bend is suited for gas or solid fuel stoves. It is made of heavy gauge steel that is laser welded to fully seal all joints, which prevents flue gases from leaking into your space and allows proper flue gas flow. Meant for use internally within the home, this exposed pipe has two coats of high quality black enamel applied to both the inside and the outside the pipes. The finished thickness of the steel pipe and the heat-resistant enamel coating is 1.2 mm, which will guarantee your paint finish to last for years, and will look fantastic in any home's decor. 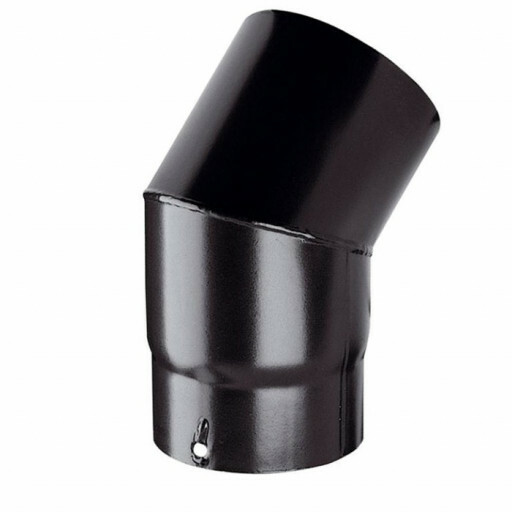 Our 45 degree flue bend is designed for easy installation. The male end of the pipe must be installed facing downwards for proper flue venting. This single-wall pipe is for internal use only and is not meant to pass through any surface or used as a chimney liner. The black coating will enhance your room's decor and is made to match the finish on many stoves common in the UK. The flue pipe can be cut down to size on the non-tapered end for a perfect fit when finishing off your internal flue pipes. The tapered male end is 50mm high and slips into another pipe creating a safe, tight fit.